The Mt Stuart Iron Ore Joint Venture was terminated on 12 April 2017. The former JV tenements (ELs 08/1135, 1292, 1330, 1341 and ML’s 08/481,482) are now wholly-owned by API Management Pty Ltd (“API”) The shareholders of API are the parties to the unincorporated joint venture known as the Australian Premium Iron Joint Venture (APIJV). The participants in the APIJV are: Aquila Steel Pty Ltd 50% (the ultimate owners of which are Baosteel Resources Australia Pty Ltd (85%) and Aurizon Operations Limited (15%)); and AMCI (IO) Pty Ltd 50% (the ultimate owners of which are AMCI Investments Pty Ltd (51%) and Posco WA Pty Ltd (49%)). Baosteel and Posco are subsidiaries of major steel producers in China and Korea respectively. 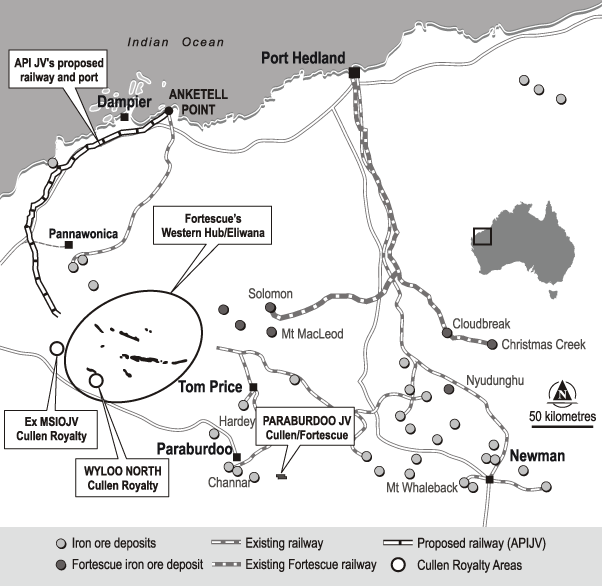 API is managing the proposed development of the West Pilbara Iron Ore Project (WPIOP) – Stage 1 (40 Mtpa). Cullen owns a 1% F.O.B. Royalty on any and all future production of iron ore from any of the former Mt Stuart Iron JV tenements. Cullen has a 1.5% F.O.B. royalty up to 15 Mt of iron ore production from the Wyloo project tenements, part of Fortescue’s proposed Western Hub/Eliwana project, and will receive $900,000 cash if and when a decision is made to commence mining on a commercial basis – E47/1649, 1650, ML 47/1488-1490, and ML 08/502. Fortescue Metals Group Ltd (Fortescue) can earn up to an 80% interest in the iron ore rights on Cullen’s EL52/1667, located ~25km southeast of Paraburdoo in the Pilbara Region of Western Australia. EL52/1667 includes potential for bedded iron deposits within the Brockman Iron Formations, along strike from the Paraburdoo and Channar Group of iron deposits.